It has been so long since I’ve featured a Tuck and Cover inspired hairstyle. 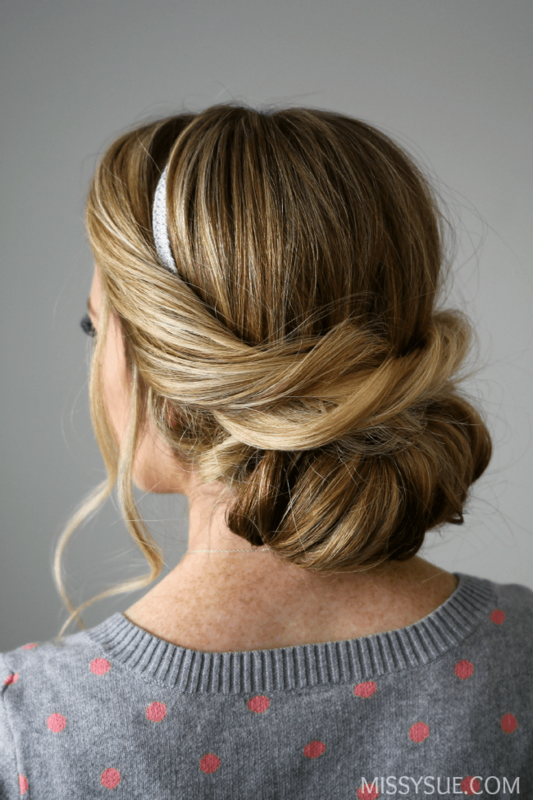 That tutorial will forever be one of my favorites and this Wrapped Headband Updo is sure to be a new favorite too. 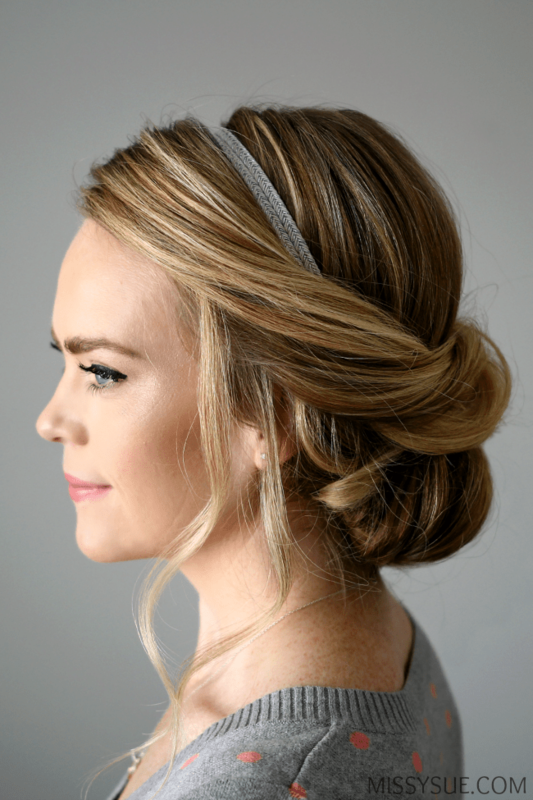 This tutorial is…quick and easy and only requires a stretchy headband and a few bobby pins. If you find your headband sliding around throughout the day then I recommend securing it with a few bobby pins. That always helps me along with a great texture spray so my hair has a bit of grip. 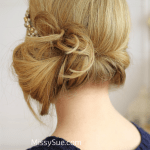 Fresh hair can be slippery so try this the next time you wear this style out and about. 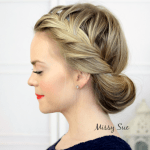 If you love this look then be sure to check out these other headband hairstyles! Step 1 / Spray the hair with a texture spray to add a bit of grip to freshly washed hair. Then place a stretchy headband over the head about 2″ back from the hairline, sliding it down towards the nape of the neck. Secure the band with bobby pins if necessary to secure it in place. Step 2 / Divide the hair into three sections; from the part down to the left and right ears creating two side sections and a back section. Tie the back section into a loose, low ponytail, pulling the elastic down as close to the ends of the hair as possible. Step 3 / Roll the back section upwards towards the headband. Step 4 / Tuck the hair into the headband, rolling it as tightly as possible before pinning down the section, sliding the bobby pins in vertically against the head. Step 5 / Take the section on the right side and twist it all together, upwards. Step 6 / Gently pull on the top of the twist to loosen it slightly. Step 7 / Lay the twist over the top of the bun and secure it with bobby pins. Step 8 / Twist the section on the left, loosening it as well. Step 9 / Lay the twist over the first twist, pinning it against the head. Step 10 / Curl any strands framing the face.Then spray the style with a firm-hold hairspray to set it. Just wanted to let you know in case anyone else comes across the same issue.